Daniel Wagstaffe Goodwin purchased the Town Flour Mills in Mill Street in 1845 and modernised them in 1881. The building, originally a steam mill, was situated between the watermill and the road. It had four storeys and was built in 1881. Wheat for the mill was delivered to a wharf on the Staffordshire & Worcestershire Canal and from there was conveyed by a narrow gauge tramway that ran south for about a ¼ of a mile to the mill. The tubs had special hopper bottoms to offload their contents directly on to an elevator, which then carried the grain to the top of the building. The tramway was closed between about 1924 and 1939 and dismantled. After flour milling had ceased, the buildings were adapted for other purposes. No trace of the tramway remains. The tramway was horse worked and was only used when a loaded canal barge was unloaded at the wharf. There was a crane at the wharf used for unloading the wheat. An empty hopper wagon would be collected from the mill and the boat's horse used to tow it to the wharf for loading. The hopper was square at the top and tapered down to a square hole with a steel plate across it. After loading the wheat the horse pulled the loaded hopper back to the mill. 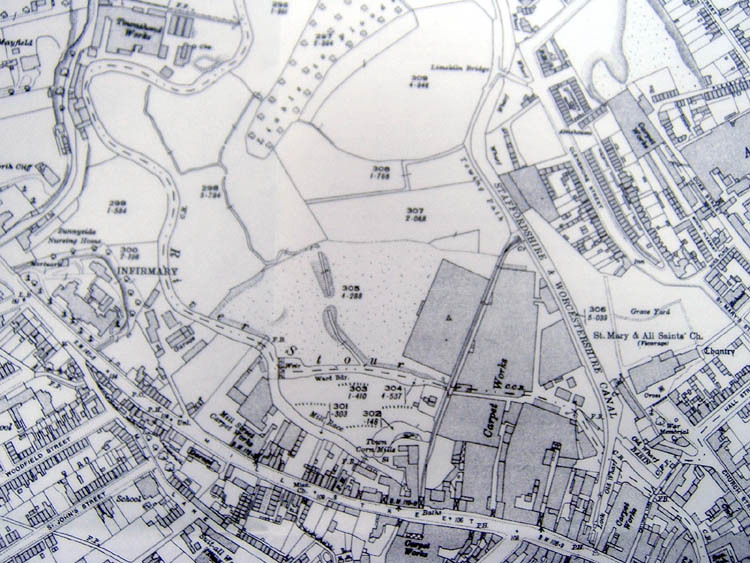 This extract is from a 1924 Ordnance Survey map of Kidderminster.